Heck, you lot are a diverse bunch. Following on from our Music to Design to post, here's the Music to design to playlist on Spotify. We've selected (in a fairly haphazard way) some of the more popular tunes from the albums everyone's been recommending. We generally picked the first album mentioned in each case, though not all of them were available via Spotify. The running order is just set to the order the comments came in. We'll keep adding as long as people keep suggesting stuff. Here's the scene. You've got a deadline looming, so it's time to stop Twittering about what you had for lunch and get on with coming up with some startlingly fresh ideas. But, first, you need to put on some tunes to get you in the mood. What do you listen to? What's the music that does it for you when you're designing? Is it a bit of Vangelis, some Steve Reich, a dose of Autechre, or a chunk of Radiohead? Drop us a comment, and let us know your three top albums (in order of preference) for designing to. Or, if you're one of those freaks people who likes absolute silence, let us know that too. And once we've got a solid list together, we'll put together a Spotify playlist or somesuch. 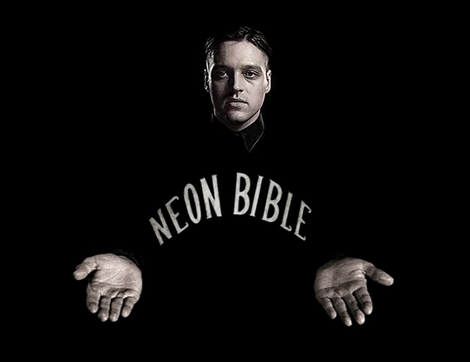 Arcade Fire have just launched the new online video for their single Neon Bible, from the album of the same name. We've had the CD on fairly solid rotation here in the We Made This studio, and this is one of our favourite tracks. It's not often in this media-saturated, webbed up world that someone can pull something off that is (more or less) a complete surprise. So kudos to the boys from Radiohead for pulling their new album out of the bag without anyone really knowing it was happening. 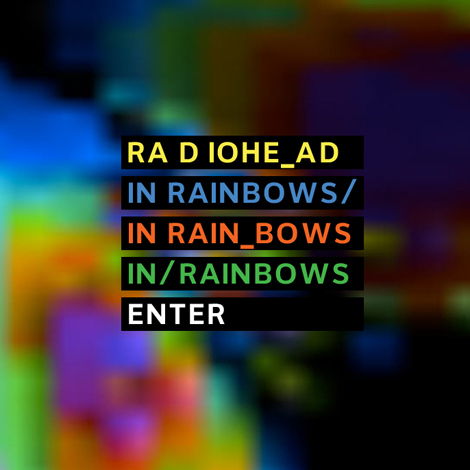 They've just announced the release of their new album In Rainbows, which will be available from Wednesday 10 October. But not content with just catching the media with a surprise release, they're also rethinking how an album is released. At liberty to do pretty much what they want as they're not signed to a record label, they're releasing it as a download only first, and they've left it up to the buyer to choose how much to pay for it. But you can also pre-order a handsome box-set of the album, designed in collaboration with Stanley Donwood, for delivery sometime on or before Monday 3 December. The set includes the ten track CD, and LP of the same, a digital download, an extra CD with eight further tracks, photos and artwork, plus art and lyrics booklets. It'll set you back £40. Then in early 2008 they'll release it as a standard CD. This all raises some fascinating questions about the financial and emotional value we place in music, both as audible experience and tangible physical product. Obviously the guys in Radiohead aren't short of cash, so it's not a huge deal for them to release the music without asking anyone to pay for it. Does it devalue music to do so? Or at least make us rethink our expectations about what we should pay for digital downloads? And releasing a sumptuous box set reflects on the emotional worth of a physical item. The Guardian music blog has posted about it, and the comments make for fascinating reading. And check out Creative Review's blog for a look at the box set. We think it's all pretty groovy. Our only problem is the In Rainbows website. Yeeurch. It looks like a migraine.